Trained in Germany during the Bauhaus period, Wolpert is known for popularizing Modernism in Jewish ceremonial metalwork. He taught at the New Bezalel School for Arts and Crafts in Jerusalem and later at the Tobe Pascher Workshop at the Jewish Museum, New York. Wolpert's work is characterized by the use of stylized Hebrew letters as a primary design motif. 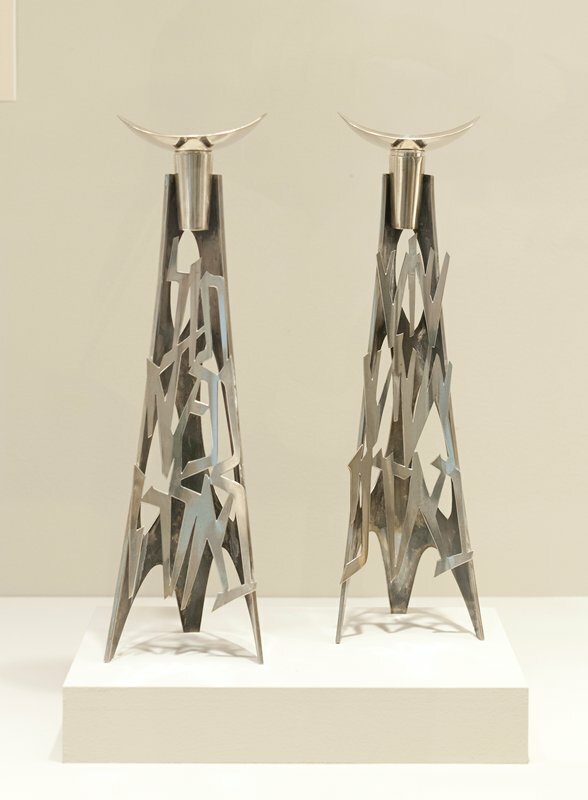 This pair of candlesticks, a necessary element in the ceremony welcoming the Sabbath, is typical of Wolpert's design aesthetic, featuring stylized, geometric Hebrew letters integrated into architectonic forms.